Home / fiber optic / HOW DOES FIBER OPTICS WORK? The Romans must have been particularly pleased with themselves the day they invented lead pipes around 2000 years ago. At last, they had an easy way to carry their water from one place to another. Imagine what they’d make of modern fiber-optic cables—”pipes” that can carry telephone calls and emails right around the world in a seventh of a second! Photo: Light pipe: fiber optics means sending light beams down thin strands of plastic or glass by making them bounce repeatedly off the walls. This is a simulated image. Note that in some countries, including the UK, fiber optics is spelled “fibre optics.” If you’re looking for information online, it’s always worth searching both spellings. We’re used to the idea of information traveling in different ways. When we speak into a landline telephone, a wire cable carries the sounds from our voice into a socket in the wall, where another cable takes it to the local telephone exchange. Cellphones work a different way: they send and receive information using invisible radio waves—a technology called wireless because it uses no cables. Fiber optics works a third way. It sends information coded in a beam of light down a glass or plastic pipe. It was originally developed for endoscopes in the 1950s to help doctors see inside the human body without having to cut it open first. In the 1960s, engineers found a way of using the same technology to transmit telephone calls at the speed of light (186,000 miles or 300,000 km per second). Fiber-optic cables carry information between two places using entirely optical (light-based) technology. Suppose you wanted to send information from your computer to a friend’s house down the street using fiber optics. You could hook your computer up to a laser, which would convert electrical information from the computer into a series of light pulses. Then you’d fire the laser down the fiber-optic cable. After traveling down the cable, the light beams would emerge at the other end. Your friend would need a photoelectric cell (light-detecting component) to turn the pulses of light back into electrical information his or her computer could understand. So the whole apparatus would be like a really neat, hi-tech version of the kind of telephone you can make out of two baked-bean cans and a length of string! Photo: Left: A section of 144-strand fiber-optic cable. Each strand is made of optically pure glass and is thinner than a human hair. Picture by Tech. Sgt. Brian Davidson, courtesy of US Air Force. A fiber optic cable bent around in a loop with red light shining down it. Photo: Left: Fiber-optic cables are thin enough to bend, taking the light signals inside in curved paths too. Picture courtesy of NASA Glenn Research Center (NASA-GRC). How total internal reflection keeps light rays inside a fiber-optic cable. Light travels down a fiber-optic cable by bouncing repeatedly off the walls. Each tiny photon (particle of light) bounces down the pipe like a bobsleigh going down an ice run. Now you might expect a beam of light, traveling in a clear glass pipe, simply to leak out of the edges. But if light hits glass at a really shallow angle (less than 42 degrees), it reflects back in again—as though the glass were really a mirror. This phenomenon is called total internal reflection. It’s one of the things that keeps light inside the pipe. Artwork: Right: Total internal reflection keeps light rays bouncing down the inside of a fiber-optic cable. Artworks: Above: Light travels in different ways in single-mode and multi-mode fibers. Below: Inside a typical single-mode fiber cable (not drawn to scale). 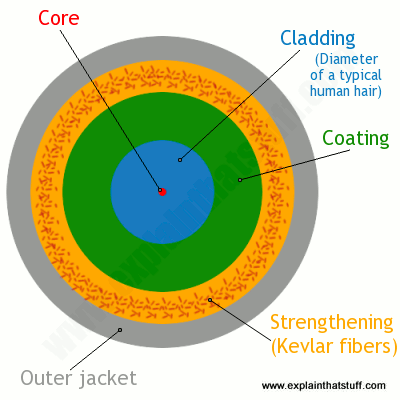 The thin core is surrounded by cladding roughly ten times bigger in diameter, a plastic outer coating (about twice the diameter of the cladding), some strengthening fibers made of a tough material such as Kevlar®, with a protective outer jacket on the outside. 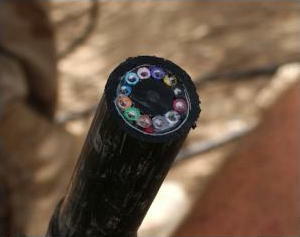 A cross-section of a typical fiber optic cable showing the core, cladding, Kevlar reinforcement, and outer jacket. The simplest type of optical fiber is called single-mode. It has a very thin core about 5-10 microns (millionths of a meter) in diameter. In a single-mode fiber, all signals travel straight down the middle without bouncing off the edges (red line in diagram). Cable TV, Internet, and telephone signals are generally carried by single-mode fibers, wrapped together into a huge bundle. Cables like this can send information over 100 km (60 miles). Even thicker fibers are used in a medical tool called a gastroscope (a type of endoscope), which doctors poke down someone’s throat for detecting illnesses inside their stomach. A gastroscope is a thick fiber-optic cable consisting of many optical fibers. At the top end of a gastroscope, there is an eyepiece and a lamp. The lamp shines its light down one part of the cable into the patient’s stomach. When the light reaches the stomach, it reflects off the stomach walls into a lens at the bottom of the cable. Then it travels back up another part of the cable into the doctor’s eyepiece. Other types of endoscopeswork the same way and can be used to inspect different parts of the body. There is also an industrial version of the tool, called a fiberscope, which can be used to examine things like inaccessible pieces of machinery in airplane engines.